Local authority leaders have called for future council elections to be held on a different day from the vote for the Scottish Parliament. 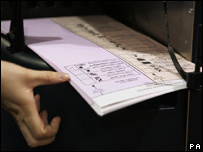 More than 140,000 ballots were spoiled on 3 May when both votes were held. Scottish council umbrella group Cosla criticised ministers for ignoring warnings that their ballot arrangements risked electoral chaos. 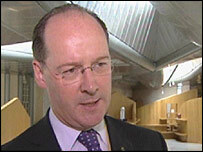 Finance Secretary John Swinney said he was keen in principle to take the proposal forward. Cosla officials believe running council elections at the same time as the Holyrood election, involving first-past-the-post and two separate proportional representation systems, was directly responsible for voter confusion and the large number of spoiled papers. At a meeting they also noted that the council elections were almost completely overshadowed in the media. Therefore they believe the elections should be separated even though they recognise the extra cost involved. Cosla president Pat Watters said: "The feeling at the meeting was to have a five-year term for councils with the next local government elections being in 2012. "Discussion also focussed on mid-term in relation to the Parliament elections being the best time for local government elections and indeed perhaps we should look at two five-year terms for a transition to get to this point and then revert to four-year terms." Mr Swinney said: "Cosla's report on decoupling the Scottish Parliament and local authority elections is very helpful and I am keen in principle to take forward the suggestion they have made. "There is a need to ensure local authorities get the opportunity to speak to the electorate on local issues without the noise of a national election. "I will take forward early discussions with Cosla to examine the practical issues involved in this proposal before going back to parliament and parliamentary committees for further consideration. "We cannot pre-empt the outcome of the current investigation into this year's election, however, the points raised by Cosla are an important contribution to the ongoing discussion on the future arrangements of elections in Scotland." Scottish Conservative MSP Gavin Brown said: "We have been constant critics of the decision to hold these two important elections on the same day. "The arguments in favour of local democracy have been well rehearsed. The events of May 3rd have only added fresh ammunition to the compelling case for de-coupling." He said the Scottish Tories would be re-submitting a member's bill on the issue. "I am encouraged by John Swinney's comments today and will seek an early meeting with him to discuss the best way forward," he added. "If local democracy is to flourish and be truly accountable, then it must have its own day in the spotlight." A Green Party spokesman said: "We agree that it makes sense to hold the ballots separately but the conclusion that this was the main reason for the number of spoilt papers is dubious considering the extent of concern over the Holyrood ballot paper design. "Such conclusions cannot be reached till we see the result of the election review."